Funny how certain films come back to haunt you. I was a student in late 1980s London when I first saw Sans toit ni loi, and I remember liking everything about it. The terse English title Vagabond. The poster image of Sandrine Bonnaire with windswept witch’s hair and the horizon in her eyes. The film’s cold glaucous light, the colors of icy skies and frozen earth. The evocative sense of inhabiting places I wasn’t used to seeing in films: a run-down château, a Tunisian laborer’s kitchen, and the out-of-season Languedoc landscape. I liked the challenge of a film whose central character we first encounter frozen to death in a ditch and who is brought back to life only to be returned irrevocably to extinction. But mostly I liked the way the film does to its spectators what Mona the vagabond does to those she encounters on her lonely road, leaving us troubled, intrigued, and repulsed in equal measure. Seeing the film made me want to write about it, in order to try to understand how it had worked on me. Instead, I turned in a term paper that was overly influenced by the theoretical orthodoxies of the time and the mangled locutions that accompanied them. But even that didn’t put me off the film. All these years later, I still admire the way Varda leaves things out. The way her camera tarries beside Mona as she trudges along but then abandons her in a tracking shot that will come to rest on a piece of agricultural machinery or a skeletal tree. The way Varda recruits the face-on testimonies of those who have encountered Mona. And the way Mona remains as much a mystery to them as she does to us. Vagabond was a turning point in a difficult phase of Varda’s career, her first feature-length fiction film in almost ten years, since One Sings, the Other Doesn’t (1977). Between 1979 and 1981, Varda had tried unsuccessfully to set up a picture in Los Angeles and had made seven documentary and essay films of various lengths (two in the United States, the rest in France), before embarking on Vagabond. The film proved to be one of her most successful works, winning the Golden Lion at the 1985 Venice Film Festival and a best actress César for Bonnaire; it went on to be distributed in fifteen countries. One of the films Varda made while in Los Angeles was Documenteur (1981), the title a pun on the French words for “documentary” (documentaire) and “liar” (menteur) and expressing her long-standing suspicion toward the supposed objectivity of the documentary form. In this respect, Varda shares the belief characteristic of the nouvelle vague that the distinctions made between fiction and documentary are mere generic niceties and that, cinematically speaking, things get more interesting when the boundaries are blurred and the subjective gaze of the filmmaker is asserted. Since her debut with La Pointe Courte in 1954, Varda has made only thirteen feature-length fiction films and more than twice that number of documentaries, essay films, and shorts, so it is hardly surprising that her features should be so consistently marked by a combination of documentary and fiction, Vagabond being a case in point. Allied to this stylistic hybridism—something gestured to in Varda’s own coinage for her approach to filmmaking of “cinécriture” (meaning “filmic writing”; the credits of Vagabond read, “A film directed and cinécrit by Agnès Varda”)—is her abiding interest in those living at the margins of society. Despite the sorrowful conditions sometimes depicted in her films, one of the great pleasures of them is the sheer variety of people and faces one encounters: from the lost and lonely Parisians of rue Mouffetard (L’opéra Mouffe, 1958) to the inhabitants of Varda’s beloved rue Daguerre, the street in Paris where she has lived since the 1950s (Daguerréotypes, 1976). Not to forget her hugely acclaimed essay film The Gleaners and I (2000), a wonderfully warm and personal journey through the world of “gleaners,” who live off and work with the materials that affluent society regards as garbage, which again introduces its viewers to an unforgettable assortment of people. Vagabond likewise benefits from its range of characters. Many of those whom we see paying witness to Mona were played by nonactors cast from among local people, from Assoun (Yahiaoui Assouna), the sympathetic Tunisian farm laborer who befriends her, to the philosopher turned shepherd (simply credited as Sylvain), who delivers a revealing critique of Mona’s vagabondage. There’s a wonderful sequence that illustrates the joyful consequences of such an approach—though in Varda’s hands it’s as much an ethics of filmmaking as a casting decision—when Mona, pretending to be a maid, meets the elderly proprietor of a grand house, known as Aunt Lydie, played by Marthe Jarnias, a nonactor whom Varda had previously cast in a short film (7p., cuis., s. de b. . . . [à saisir], 1984) and was so taken with that she offered her a role in Vagabond. The old lady and young girl share some cognac and are soon in gales of laughter so unforced that it looks like Bonnaire can barely contain herself. “to seize” a property and “to understand” or “to grasp” something). 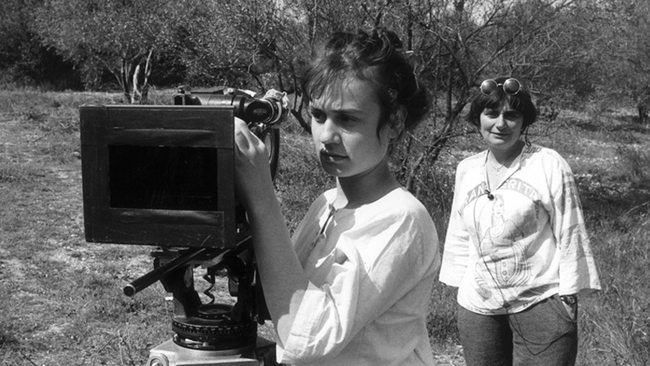 In Vagabond, Varda wanted “to film what freedom and dirt meant,” themes that overlapped with her discovery while researching the project that more and more young women were becoming vagrants. “It was in the 1980s that very young girls began to appear on the road and in doorways. They were not lost but had decided to live out their freedom in a wild and solitary way.” Duly hitting the road, she offered rides to several of these young women, including one named Setina, who plays a small role in the film. According to Varda, Setina’s experiences informed the character of Mona: “She knew that it was the vagrants’ smell, more than their poverty, that set them apart from a society that values cleanliness.” In a wonderful promotional tagline for the film, Varda summed up Mona thus: “She’s cute, she stinks, and she won’t say thank you,” asking the film’s prospective viewers, “Would you offer her a lift?” Mona is a walking affront to the world of polite society as represented by the well-heeled agronomist Madame Landier (Macha Méril), who overcomes her revulsion at the stench of the girl she gives a lift to and finds herself fascinated by, albeit as a sociological specimen. When she fetches canapés and Krug from an academic reception to share with Mona, Landier asks her why she hasn’t made anything of her education and has chosen to drop out. Mona’s minimal, eloquent riposte is: “Champagne on the road’s better.” But, as we see, there’s too little champagne and too much road. The question remains, however: is Mona dirty because she’s free or free because she’s dirty? Varda has explained she wanted Mona to be an unsympathetic character. She is, but not in a completely alienating way, something that’s harder to pull off in a film than a novel and has a lot to do with the extraordinary charisma that the seventeen-year-old Bonnaire brings to the role. The way that Mona weathers the indignities of her chosen life of “freedom and dirt”—from the everyday hustling for shelter and food to sexual abuse at the hands of predatory males—implies a steely core. Mona’s curious dignity makes her death sorrowful even in its inevitability. One can only guess whether Varda, knowing that she had captured such a magnificent performance from Bonnaire, felt safe in starting the film with Mona dead. For while this approach lends what follows the quality of an investigation, we still care about Mona in a way that this form would appear to preclude. While Vagabond was prescient in picking up on the new social phenomenon of France’s young female drifters, there’s another dimension to its portrait of those who reject society that has become more apparent in the twenty years since its original release. This is most marked in Mona’s encounter with a shepherd who gives her a trailer to live in and offers her a patch of land to cultivate—an act of altruism that Mona treats with indifference. The character is played by someone Varda had met while researching the film, a former philosophy teacher who, with his wife and child, had rejected conventional society and gone “back to the land.” His frustration with Mona derives from the obstinate lack of project or principle that he can discern behind her choice of life. In this encounter we see the confrontation of two different ideas of freedom: that of the counterculture generation of May ’68, which, utopian as it might have been, nevertheless had an ideologically defined conception of its rejection of the dominant society, and the ostensibly nonideological revolt represented by Mona, who is, in more ways than one, “without roof or rules” (the literal translation of the film’s French title). All these years later, in these new political times, Mona’s defiant independence can be seen in even more negative terms, as a logical extension of the culture of extreme individualism that has come to dominate Western society since the 1980s. Mona, the nomadic monad, knows only how to say no, and her atomized life leads—just as the shepherd warns her it will—to a lonely death. Chris Darke is a writer and film critic based in London. His work has appeared in Film Comment, Sight & Sound, Trafic, Cahiers du cinéma, Vertigo, and the Independent. He is also the author of Light Readings: Film Criticism and Screen Arts, a monograph on Godard’s Alphaville, and Cannes: Inside the World’s Premier Film Festival (with Kieron Corless). He has directed occasional works, including a video portrait of Chris Marker for Criterion’s release of Marker’s La jetée and Sans soleil. Chris Darke is a writer and film critic based in London. His work has appeared in Film Comment, Sight & Sound, Trafic, and the Independent. He is also the author of Light Readings: Film Criticism and Screen Arts, a monograph on Godard’s Alphaville, and Cannes: Inside the World’s Premier Film Festival (with Kieron Corless). He has directed occasional works, including a video portrait of Chris Marker for Criterion’s release of Marker’s La Jetée and Sans Soleil.